One of the most unusual bands to perform at KulturfestNYC, the week-long festival of Jewish music that ended its run on Sunday, was Jinta La-Mvta, a Japanese klezmer band. Yes, we said Japanese and klezmer in the same sentence. 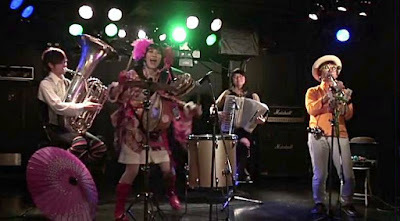 The group was founded in 2004 by Ohkuma Wataru, clarinetist and bandleader of the groundbreaking Japanese experimental folk band Cicala Mvta and his partner and drummer Kogure Miwazo. Considered as one of the few Klezmer experts in Japan, Wataru has also penned various pieces on Klezmer and Japanese liner notes of Klezmatics and Frank London. We got a glimpse and sample of the band's music at the KulturfestNYC opening concert on June 14. The next day they performed at Joe's Pub at the Public. We found a good sample of their Japanese klezmer style on YouTube and we're sharing it with you today.